Avocado Oil is a mild, nourishing oil rich in vitamins. Aloe Vera is valued for its soothing, nutrient rich and healing properties. Lotions are easier to apply to the whole body in order to add moisture. 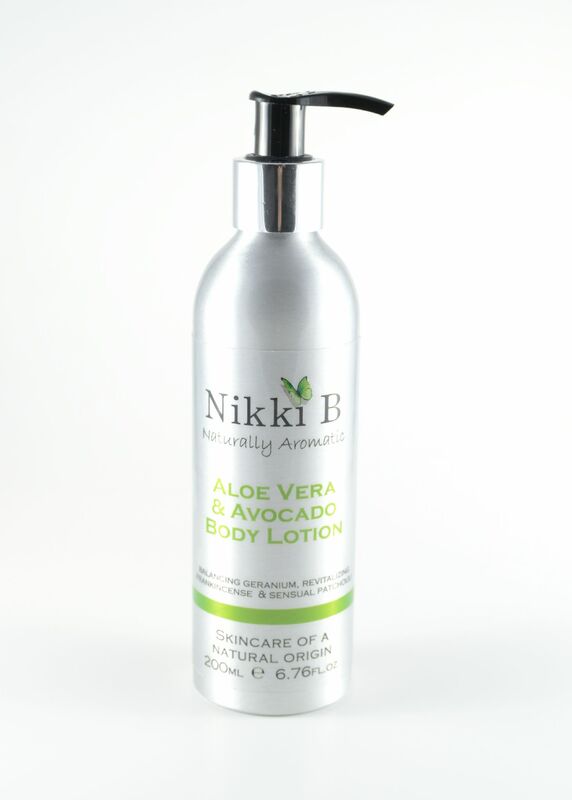 For all skin types our luxurious skin-softening lotion blends soothing aloe vera and nourishing vitamin rich avocado with an aromatic scent of balancing geranium, revitalising frankincense and sensual patchouli essential oils to balance, uplift and rejuvenate skin tone. Applying a nourishing lotion daily can help to leave skin feeling soft whilst delicately scented. Lotions are easier to apply to the whole body on freshly bathed skin in order to add moisture. Apply as required. Aloe Vera, Avocado Oil, Vegetable Glycerine, Safflower Seed Oil, Geranium Essential Oil, Patchouli Essential Oil, Frankincense Essential Oil, Vitamin E.
Aqua (water), Aloe barbadensis (aloe vera) leaf juice, Persea gratissima (avocado) oil, Glycerine (vegetable glycerine), Sodium stearoyl lactylate (emulsifier), Carthamus tinctorius (safflower) seed oil, Glyceryl stearate (emulsifier), Phenoxyethanol, ethylhexlglycerin (preservative), Cetyl alcohol, Pelargonium graveolens (geranium) flower oil*, Pogostemon cablin (patchouli) leaf oil*, Tocopheryl acetate (vitamin E), Boswellia carterii (frankincense) oil*, Xanthan gum, Citral*, Geraniol*, Linalool*, Citronellol*, Limonene*. "I love this moisturiser. Most moisturisers make my dry skin worse after the effects wear off but not this one - and people are always coming up to me to say how nice it smells!" "Makes your skin feel soft and luxurious, and great to use after the bath with the fragrance bath salts with matching essential oils. One of the best Body Lotions I have used, but natural, and you won't need any other perfume fragrance when using this Lotion!" "I use this after swimming, it goes on really well, makes your skin all smooth and smells fresh and lovely!" "This body lotion feels great on the skin. You only need a small amount so lasts for ages. A great product - something I have come to expect from Nikki B's products!" "This luxurious body lotion feels like an expensive treat but is a great value for money. It smells divine and makes my skin soft. It goes on nicely without leaving a 'tacky' feel whilst it soaks in. Instant moisturiser!! Love this product." It smells amazing and feels great. It goes on easily and keeps the skin soft and healthy. I can use this all over- including my face. I love the fact that I've found a great moisturiser and it's full of natural goodness. Thanks Nikki B"
"I love the rich texture and fabulous mixture of scents of this lotion."